The music industry has its sights set on the high number of websites and mobile apps that enable users to download the music from YouTube videos. 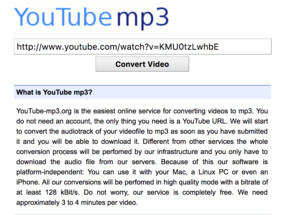 Such sites and apps can take a YouTube URL and provide a download link directly for an MP3 file. These tools can be used to make unauthorized copies of music from music videos on the world's largest video portal. Some sites include support for others including SoundCloud, DailyMotion and Vimeo. Last week, MP3Fiber was one such service that shut down due to legal threats, but many options are still available. Services an apps tend to carry advertising, which some in the industry say allows them to earn money by enabling copyright infringement. "Although coordinated action by the record industry is delivering results, with major platforms like YouTube-mp3 closed down, we must continue to act against illegal sites that build huge fortunes by ripping off artists and labels," Geoff Taylor, head of the British Phonographic Industry (BPI), told The Independent. "We hope that responsible advertisers, search engines and hosting providers will also reflect on the ethics of supporting sites that enrich themselves by defrauding creators." Action against such services is not without scrutiny from digital rights groups however. The Electronic Frontier Foundation finds that these services are completely legal, even if used for illegal purposes by users. It has pointed out in the past that there is a vast volume of online video licensed for free downloading and contain tracks not subject to copyright. Audio extractions in cases can also qualify as non-infringing fair use under copyright law. Why would I need to visit any specific site when my perfectly legal download manager offers to do it right from YouTube site itself? I might have to do some post processing with another perfectly legal applications like mkvtoolnix/mkvextract or "My MP4 Box" to extract just the the audio!